The New York Times has a piece out on the “Hispanic Paradox”. The paradox is that American Hispanics are longer-lived than non-Hispanic whites, despite the relatively lower socioeconomic status of Hispanics (poorer, less educated). The paradox has been around for a while, and these stories tend to emerge whenever there’s a Census or CDC data release, as there is now. You can get the original data on the CDC website. But I think one thing about the Hispanic Paradox that needs to be contextualized is that Hispanics are not special in manifesting this paradox. Throwing all non-Hispanic whites into one big pot aggregates real variation. The map on the left is from the paper Eight Americas: Investigating Mortality Disparities across Races, Counties, and Race-Counties in the United States. It shows the life expectancy by county for whites, Hispanic and non-Hispanic. You can see the Hispanic Paradox along the border; most Hispanics in Texas list their race as white, and so show up in these data. But you can also see what I’m talking about in terms of aggregation of non-Hispanic whites for Texas as well. See the counties in the center of Texas with elevated life expectancies? Take a look at this map on the distribution of German ancestry in the USA, and focus on Texas. More broadly, there are broad swaths of the rural north where whites are relatively poor, but long-lived, in contrast to the South. What you see on the map on the broad purple swaths are the echoes of the Yankee Empire, and the New England Diaspora, which includes the Mormons of Utah. Yankee probity seems to have attracted Scandinavians, Germans, Irish, and Italians, of like mindset. Or the children of immigrants were acculturated to Yankee values. What is the moral here? Economic development is broadly indicative of life expectancy, but in modern developed societies culture and social milieu matters on the margin, and can swamp the effects of economics. Just as heritability for height is higher in developed societies, so variation in life expectancy within developed societies may be more likely to track cultural categories than economics. Below are some charts from the original CDC report. North American Indians share the same paradox (from here). I wouldn’t take genetics off the table for this one, although it remains a mysterious issue. Not only that, but the Hispanic and Asian bars are also pretty similar, and it would be much easier to notice this if they were side-by-side. This is very strange since Hispanics and Asians don’t really have much cultural or social similarity, they come from totally different parts of the world, and speak entirely different languages. “White” americans have the worse health conditions among OECD countries. This is generally attribute to too much work, stress, bad food and the worse health system across developed nations (so that the question is why the rich US has such a terrible system). Since “hispanics” live in the same country it would be interesting to know what is going on here. Perhaps somehow their life style is not as unhealthy as those of the “whites”, thought the health system is the same. In that case, the health system would not be the main driven force behind the unhealthy US. I agree that the “whites” may not be considered just one cluster but this is even more true for “hispanics”. hispanics have more problems with obesity the deeper their roots in the USA. so the “paradox” may disappear as they assimilate more. LOL, good one! Yes, genetics can’t possibly have anything to do with it. yeah, but the question is what do you mean by “assimilation”. if you are right, that “assimilation” can be at the core of the US health issues; it would also mean that the healthy system is not driven the problems. The mortality advantage is greatest for foreign born Hispanics, but it’s still fairly large for American born Hispanics. And, of course, all the Native Americans are native American. My guess? As with the Japanese, systemic errors in data collection, deliberate and accidental. Here’s a hypothesis: Hispanics tend to have more cohesive extended families than whites. This might suggest that elderly Hispanics continue to have lots of social contact with their relatives throughout their lives, even after the death of a spouse. Elderly whites are more likely to be sent to a nursing home, or their children are more likely to have moved away from their hometowns, so they have, on average, less social contact with their relatives. I have read of studies that link loneliness and social isolation with lower life expectancy. In summary: Elderly whites’ greater likelihood of being lonely and socially isolated in comparison with elderly Hispanics contributes to the disparity in life expectancy. 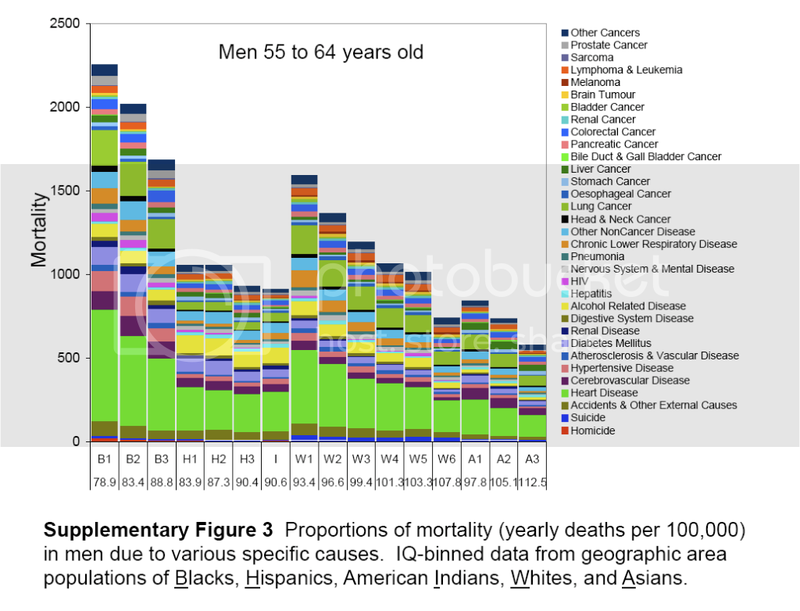 Except for a few select causes like homicide, mortality is lower for Hispanics at every age, right down to infancy, not just among the elderly. The impressively low Hispanic infant mortality rates have been around for quite awhile. Also, life expectancy in Mexico is now up to 97.5% of the overall U.S. life expectancy. I guess you’re right. In fact the gap between Hispanics and non-Hispanic whites starts to close by about .1 years each 5 year period beginning around age 40. Which suggests my hypothesis is not likely to be a very significant contributor to the overall gap, if it exists at all. With regard to the similarity in the American Indian and Hispanic rates: Are you suggesting that there might be something in the Indian genetic background of mestizos that contributes to the gap? Yeah, I suspect there is a relationship between age-adjusted mortality and population admixture, controlling for SES, with Indian ancestry related to better outcomes. Henry Harpending speculates about a genetic explanation. proneness to inflammation. Infection, Genetics and Evolution 2009, 9:1371-1380. The institutions of the Upper Midwest were established by Yankees, but the proportion of people of Anglo-Saxon descent there is the lowest of any area of the country except for NYC and a few black, Hispanic, Pennsylvania Dutch, or Cajun areas. My source is the Facts on File atlas of contemporary America. Anecdotal: My niece took parenting advice from a Hispanic in-law, and ended up producing the fattest toddler you ever saw, with double chins. She was giving him cereal in his bottle, and the doctor made her stop. maybe that’s the secret! Hispanics have a lower rate of multiple births which goes along with lower infant mortality. I actually talked with someone just yesterday that has helped to work on addressing the potential issues you’ve identified here. The epidemiologic paradox (or as it is better known the “Hispanic Paradox”) have been identified since the late 1970s. And the trends have remained largely consistent across the literature. However, concerns of misreporting have concerns have always existed, which is why the CDC and the NCHS have been hesitant about creating life tables for so long. A few years ago, they attempted to address theses issues and have found that, overall, the bias is limited. This is just one of many steps taken to arrive at the life tables reported not too long ago. First, while the NCHS is fairly comfortable that they are not under-reporting Hispanics any longer, they acknowledge a 1-2% over-reporting of whites which can influence the numbers used in these comparisons. Second, age reporting can is biased, with people rounding their age to a higher or lower number depending on their preference. These preferences are often culturally selected. So, the age distribution while treated like separate distinct values is measuring significantly overlapping values. Third, many of the researchers in my department who have been looking at this issue for several decades are convinced that a large part of this effect is due to Mexican Immigrants migrating in to the US. This has created a selection bias due to those people coming into the US being more healthy than others. This is somewhat supported with acculturation effects leading to decreased differences as aging occurs and with children of immigrants often losing any benefit that their parents had. More research would need to be done to differentiate immigrant Hispanics from other Hispanic immigrants in the United States. There was also some whispering of a ‘Salmon Bias,’ where those who come to the US leave to go back to Mexico, or whichever country to die. However, the most recent evidence found that there is an in and out migration effect for both Hispanics and other racial groups (including Whites) which balances out the overall effect. The salmon bias may maintain a small effect but not enough to account for the huge disparities. Sorry. It’s the mid to late 1980s not the 1970s.